The first recorded Police Officer in Butler Township was in 1922 when Al Macko was hired. The department was officially formed in 1926. D. M. Donaohue became Police Chief in 1929 and was assisted by Joe Sheptack and four officers. The officers were from the various areas of the township- Lyndora, North Butler, Rose Hill Cemetery District and Meridian. At a later date Joe Sheptack became Police Chief until his retirement in 1959. Charlie Miller became Police Chief that same year and remained in the position until 1972. Metro Polosky was appointed Police Chief in 1972 and retired in 1979. Joseph Furka was next to be appointed Police Chief. Furka was hired as a patrolman in 1964 and rose through the ranks- Sergeant, Detective Lieutenant, before being appointed Chief. Chief Furka retired in 1986. Gary D. Garman was next appointed Police Chief in 1986 and retired in January 2013. The current Chief, John R. Hays, was appointed in March 2013. Chief Hays was hired as a patrolman in 1979 and rose through the ranks, holding the positions of Sergeant, Detective Sergeant and Lieutenant. The department started with one officer in 1922 and has grown to the current compliment of 21 full time officers, 2 civilian office assistants and 2 animal control officers. 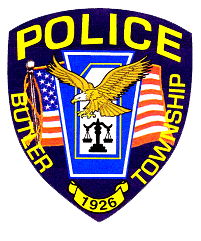 The Butler Township Police Department provides 24 hours coverage to the over 17,000 residents and numerous businesses.